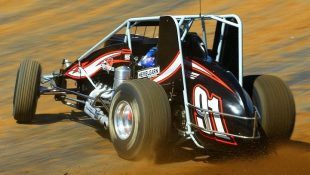 Brachmann Victorious in Hurricane 100 at Brewerton :Racers Guide – The Web's #1 Racers' Online Directory! BREWERTON, NY- October 6, 2017- For the entirety of Chad Brachmann’s racing career where the Brewerton Speedway in Brewerton, N.Y., has been concerned, if it weren’t for bad luck, quite frankly he’d have none at all. 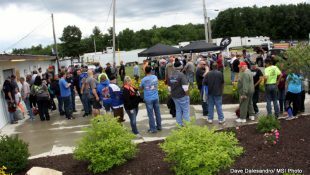 Season-after-season, the North Tonawanda, N.Y., resident has been coming to the ‘D-Shaped Dirt Demon,’ and season-after-season, the veteran small-block modified campaigner has been left dejected and disappointed at the end of the evening. On Thursday night, Brachmann finally got the proverbial monkey off his back with a hard-fought – and convincing – victory in the 100-lap contest for the Super DIRTcar Series small-block modifieds. After fighting tooth and nail to get to the top spot, the driver of the Bellamy Towing sponsored No. 3 entry would have to hold off one of the best in the history of the Onondaga County facility; Pat Ward. When a driver has a car that stout, that seemingly perfect right off of the hauler, it’s easy to start playing mind games with themselves. Should they adjust the car? Or should they just leave it alone? The course of action and the decisions that can make or break your night when you have everything to lose certainly take their toll more so than when you have nothing to lose. Though he undoubtedly had one of – if not the – strongest cars in the field on Thursday night, the path to the front was anything but easy. Brachmann had to pass Danny Johnson, Tim Sears Jr. and then duel with early race leader Mario Clair to take over the top spot. The aforementioned drivers were difficult without question, yet the most difficult battle Brachmann faced in both the early and latter stages of the event came with the Gypsum Express sponsored No. 42p of Pat Ward. The game plan that Brachmann spoke of earlier included running the bottom and running his own race; it did not include having his decisions affected by outside circumstances. Utilizing that mindset, Brachmann was able to keep his nose clean and – most importantly – keep his car in position to challenge for the win when it counted most; the final laps of the feature. By ‘doing what they do,’ Brachmann was able to save his tires and patiently roll the bottom lane at both ends of the speedway. He found himself in such a rhythm that it seemed as if nothing could stop him from finally completing his quest of reaching victory lane at Brewerton. Nothing – that is – except himself. With only four-laps remaining, he almost became his own worst enemy as he tangled with the Bernard Racing No. 54 of Steve Bernard and caused a caution in the process. The comfortable lead that he had built disappeared in the blink of an eye and second place driver Pat Ward would have another chance to take Brachmann’s dreams of victory and relegate them to the dumpster for yet another year. Though it did all work out, that late-race restart wasn’t as easy as it may have seemed from the outside looking in. Pat Ward came flying – for lack of a better term – to the outside at the entry of turn one and even Helen Keller could have seen the brightly lettered No. 42p out the right window had she been behind the wheel. Fortunately for Brachmann, he’s a veteran and knew exactly what he had to do to carry his momentum to the checkered flag. Needless to say, he made his car wide enough to hold off Ward and finally reach victory lane at the one track that has eluded him for all these years. There aren’t many words found in the dictionary to describe what Brachmann felt as he crossed the finish line on Thursday night; at least not the type of words that one can put into print.